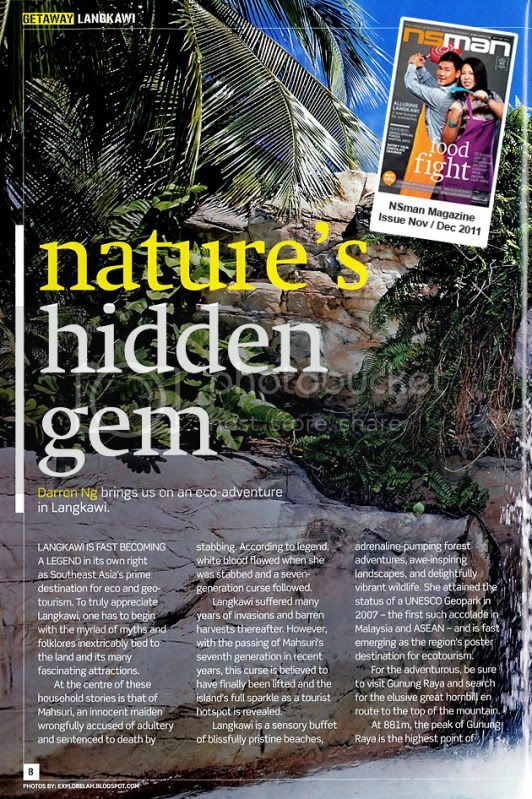 When I received a copy of the NSman magazine in my mail last night, I didn't expect to see my feature story about Langkawi published in it! Felt so excited yet strange at the same time to see my name in print. 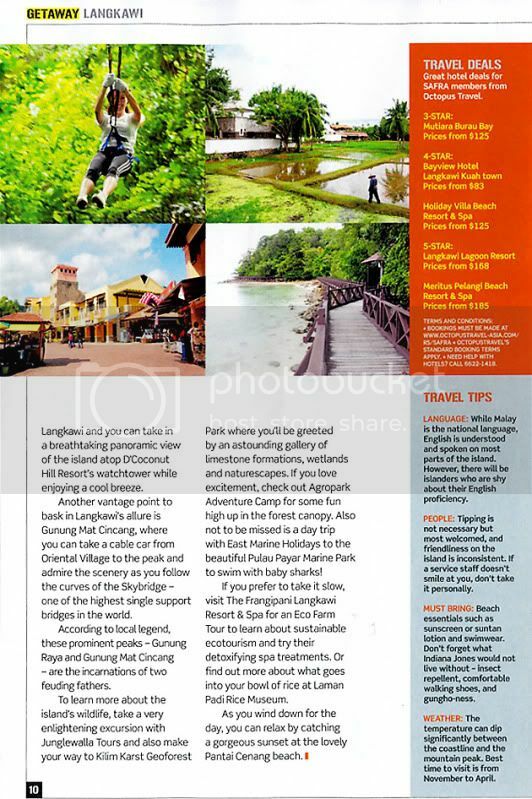 This is my very first travel article in a magazine. Woohoo! Hope you'll enjoy it! The original title of this piece was "dECOrate Your Senses" but it was changed by the editor. Had wanted to express the variety that Langkawi offers to make for a colourful, beautiful experience on the different senses that flourishes within an abundance of eco-centricity. That's why "ECO" was hidden within "decorate". Langkawi is already known as the Jewel of Kedah, so I didn't want to repeat the jewel/gem approach. But the new title is more direct and easier to understand than having to decipher the meaning behind my original title. I think the new title summed up my original intent really well and it's gentler on the senses because comprehension of the meaning was made more digestible. Many thanks to the editor! But I still preferred my original title although it's harder to appreciate. Just like some places we go to where bliss is not imediately apparent. I think Langkawi is somewhat like that. For people who prefer metropolitan settings, this island may take some getting used to. But for nature buffs, Langkawi is truly a gem!